You're an international banker, marketing manager or production supervisor. You call a colleague, supervisor or supplier in Latin America or Spain. The only foreign word you know is hola, but when the receptionist answers the phone speaking rapid-fire Spanish, you don't panic. You ask to be transferred to Mr. So-and-So. "Just a minute, sir. I'll put you through," the receptionist responds in perfect English. With Americanized English the common tongue for much of the industrialized world, knowing a second language might seem as useless as learning Morse code. However, executive recruiters and hiring personnel say North Americans who speak Spanish can do far more than chat up Latino receptionists. 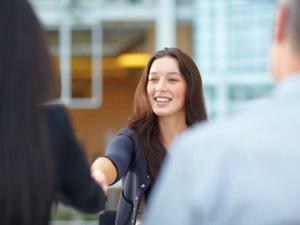 Bilingual skills help job seekers land work. They can lead to key assignments and pay raises. In some cases, they may even be a job requirement. "If I send US nationals into another country, I want them to acclimate and assimilate quickly," says Tom Birmingham, Korn/Ferry's managing director of global accounts. "Sure, in certain areas of Latin America they can get around OK without knowing Spanish, but personally and professionally I want them to feel comfortable." Birmingham notes that an employee who can navigate a foreign environment with ease will probably be both happier and more productive than one who cannot. From a business standpoint, speaking another person's native language helps win trust. "Global companies look at people who have global skills," Birmingham says. "And the ability to speak other languages, especially Spanish, is a global skill." Spanish-speaking ability is also important in the US. Birmingham recently drove through the Atlanta suburb of Norcross and estimates 70 percent of the billboards were in Spanish. "It's not just California and Texas anymore," he says. "Throughout the Southeast, more and more people are speaking Spanish." They come to work in agriculture and manufacturing, which translates into job opportunities for bilingual managers and supervisors. Customer service operations are also hiring bilingual workers. From clerks at the Department of Motor Vehicles to call center representatives to supervisors in the hospitality industry, the growth of Spanish speakers as both customers and workers means more demand for bilingual customer service. According to the Society for Human Resource Management, up to 20 percent of call center companies' staffs are bilingual. Salaries vary depending on additional skills required, but some call centers pay bilingual workers 50 cents to a dollar more per hour. The Korn/Ferry survey showed the greatest need for bilingual employees is in the consumer services sector, particularly banking, retail and telecommunications. Bilingual executives are most frequently needed in marketing, sales and general management and to serve as president or CEO. The rise of bilingualism represents a cultural shift for many Americans. "We're not a multilingual country," Birmingham says. "A lot of students take another language because they have to, to graduate." However, he sees a shift in attitude, particularly among people who want to work in the global economy. "If you see yourself doing work internationally or going into banking or trade or any other business where you'll travel, you'll take Spanish more seriously," Birmingham says. Spanish-speaking job seekers can do more than simply highlight their language ability on a resume, Birmingham says. One suggestion: Offer to conduct a job interview in Spanish, which shows you're confident and assertive. Keep in mind both English and Spanish may one day be less relevant in the global marketplace. According to the Information Please database, 329 million people now speak Spanish as a first language, and 328 million speak English. However, more than 1.2 billion people speak Mandarin Chinese.